This is the childhood memoir of writer, teacher and historian Peter Paterson, who recently passed away. Published in 1998, it is one of the most important histories of Stirling for our times. 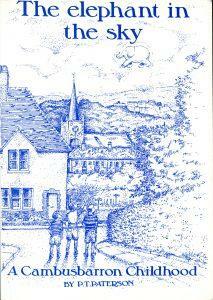 It is a remembrance of things past and a detailed account of growing up in Cambusbarron in the 1950s. It is lyrical and written with style, love and fluency, but without sentimental nostalgia. The elephant in the sky was a large helium balloon flown above Billy Smart’s Circus when it visited King’s Park and seen from all over Stirling. For Peter Paterson, it symbolised the magic of his childhood, where the sandstone blocks of Cambusbarron Primary School seemed to have been fashioned by the Israelites under the supervision of Moses and even the local Cowp contained a world of exploration. So much of Paterson’s narrative is the common experience of a 1950s Scottish childhood – the family paying £27. 10s for a set encyclopaedias over three years but giving the Beano Book 1954 at Christmas 1958; hiding under the table when the rent man called. A war-wounded uncle bedded in the sitting room. The richness of the description validates the lives of so many others that the book should be a Scottish classic. The cover illustration is by George Waller, former Principal Teacher of Art at St Modan’s where Peter Paterson taught.